Tyler's Band Performs "Johnny Be Good!" Happy Holiday Season! May God's Blessings OVERTAKE you and your loved ones! It's most important as one of my parenting missions to empower my children with experiences that develop their ability to secure gainful employment. I believe that they both, Carter - 16 and Bakary - 13, will support themselves financially as adults. My boys and ASD individuals all over the world have skills and talents that, if identified and nurtured will serve us all. Last year I met a Mother with the same beliefs. Theresa Jackson has two sons, Josh and Tyler and a daughter, Tosha. Tosha is an incredible cook who's pastries are to LIVE FOR! Theresa always baked. Tosha grew to love it as well. She now caters parties, teas and weddings. Her company is Sugar Babes Sweetery. Josh always loved trucks. Monster Trucks were his favorite. When he got into his teen years, his interest in trucks turned to race cars. Joshua had a natural talent for fixing things so, naturally he learned, at an early age, to tinker under the hood. Josh was looking to build his first race car. Against her better judgment, Theresa allowed Josh to buy a MR2 when he was 18 years old. She had a second car which she urged him to drive. But he had to have a MR2 that he could drift around the race track. He spent hours and extra money repairing it. Now it sits on blocks in Theresa's drive way. Her indulgences paid off when Josh studied auto mechanics at Pasadena College. And just last month he landed a position as Lube and Tune Technician at Galpin Ford! Is that AWE - SOME? This Mom, by example, has instilled a strong work ethic in her children. Her faith in God's ways has also been imparted. She has diligently guided them to succeed even when the challenges, economy or job market seemed impossible to concur. Foremost she helped her children believe in them selves as she persevered in the corporate world excelling and advancing over the years. She is now Director of Post Production and my immediate Supervisor. 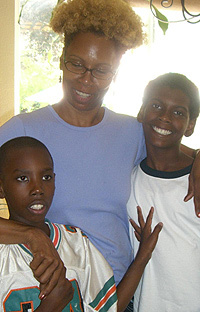 We bonded as kindred spirits, her son Tyler has been diagnosed with aspergers. She shared with me her struggles with home work and finding programs and methods to strengthen Tyler academically. At one point she turned down an administrative position understanding her demands as a Mother superseded those in the work place. She also encouraged Tyler to socialize enrolling him in social groups at Advance LA as well as family gatherings. She knew it was imperative that she continue to build his confidence in himself. Tyler taught himself how to play the drums. Even so, it was a bit of a surprise to Theresa when she and Tyler's Dad attended an orientation assembly at The Music Institute in Hollywood and Tyler won a scholarship. She said when they called his name, unlike the other recipients who took the stage by way of the stairs, Tyler gracefully leaped onto the front of the stage. "He looked so cool! Everyone cheered." Theresa says that day, she saw something in Tyler she'd never seen before. Parenting is a job where the proof of the invested hours takes a lifetime to reveal it self - the CHILD's LIFE TIME. One day, our kid does something that validates our dedicated efforts, often sacrificial, often selfless. Last Christmas Holiday break I asked a Bible Study friend and auto shop owner, Samir, to let Carter come in to observe. He learned to change tires and check the oil and take instructions. I trusted Samir with my car as he had helped many of our Bible Study comrades, in a pinch. Turned out, he was an excellent influence on my son. When Theresa mentioned she wanted to find a job for Tyler I referred her to Samir because Tyler was obsessed with cars before he could talk. He was attending school at Pierce College in Woodland Hills where he studied automotives, like his big brother. Sharing how Carter enjoyed the exposure she contacted Samir and we made it happen. Tyler was pleased to be at Fire Star Tires. Only Samir confided in me, after one week, that the young man was not working out. Inquiring why, I asked him to speak with Theresa so she could give him insight regarding how our kids - spectrum kids - communicate and respond to unique ques. I let Theresa know that she should talk to Samir about Tyler. A couple months later after Bible Study, with a gleam in his eyes, Samir told me how wonderfully Tyler was performing. "All the guys at the shop love him! He's like family!" It gets better. I couldn't wait to tell Theresa. She Beamed with joy and went on to tell me how she took her car to Fire Star Tires to have work done. She said that Tyler helped work on the car. He also presented her the bill while thoroughly explaining everything that was done to the car. She was beside herself, extremely proud and absolutely THRILLED! You never know who's in your life for what reason. You don't always know who's gonna bring you business or what choices will bring you the most joy. We often have no clue how our influence on one another shapes their future. Sometimes, we don't even know how we are a blessing to those around us, just as much as they are a blessing to us.